nationally by the factories as well as the aftermarket companies. This year the winning rider in every class at Sunday’s showdown will be awarded #1 number plates to go along with the events awards, the product, the purse, and the factory contingency. To display it with a rider’s other awards, post it on the wall in the shop, or give it to your primary sponsor will up to the riders who have the speed and luck to take it home. “We are always looking for ways to reward the riders and give them more for their racing dollar” said Sam Gammon, Victory Sports President. 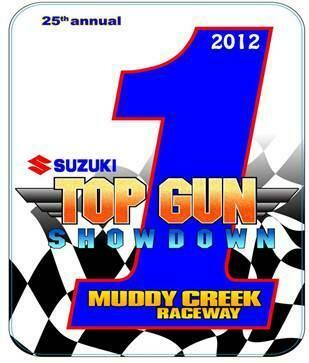 The 25th annual SUZUKI Top Gun Showdown will get started with a Practice Day on Friday (9:30 til 3:30) followed by the VURB Team Pit Bike Race, and the RACER X Wheelie Contest. Saturday will have practice at 8:00am then round #15 of the THOR Mega Series (2 motos), followed by the FMF Jump Contest, then the DUNLOP Pit Crew Competition (changing a rear tire – timed against the clock). Sunday is the “Main Event” with a brief practice at 8:00am followed by round #16 of the THOR Mega Series which is the series finale. Sunday’s race also pays points for the PARTS UNLIMITED Ultra Series and the MOTUL Southern All-Stars Series.